If we were to survey the working histories of all the steam locomotives that remain in operable condition today, we would quickly discover a common theme. The great majority of them, even some of the most famous of the iron titans, came breathtakingly close to being dismantled by the scrapper’s torch. Most of them survived after being taken out of service because of some fluke of history. We are able to cherish and enjoy our surviving steam locomotives because of dumb luck. The United Kingdom has an enviably thick concentration of operating steam locomotives. It would not be out of turn to assume that they have a particularly strong dose of good fortune. What is surprising, though, is that the favorable climate towards preservation was an unforeseen silver lining of the Modernisation Plan and the Beeching Cuts. Both of these recommendations adopted by the British Railways were heavily lambasted by the public and resulted in a high number of individuals losing their employment, and failed to bring any financial solvency to the British Railways. Neither plan anticipated railroad traffic doing anything other than declining, and the railroad managers of the time were unforgiving in closing unprofitable lines and, as a matter of policy, sold off the land where the condemned railroads had been located. More conspiratorial readers of history might make a decent argument that British Railways was pressured into the land sales by representatives of the road transportation industry, who had a vested interest in ensuring that the railroads could not be revived as competition if freight traffic were to increase at some point in the future. Most of the land put up for sale was purchased by private investors and developed into housing developments or commercial centers. In some cases, though, dedicated fans of a specific line were able to negotiate purchase all or at least a significant portion of a condemned railroad. Bluebell Railway no. 80100, before and after restoration. Many of the best-known heritage railroads operating in Britain were closed during the Modernisation and Beeching eras and later revived by members members of the public. The Bluebell Railway, for example, had been suggested for closure in 1954 but remained open on a legal technicality until 1958. The following year, the Bluebell Railway Preservation Society coalesced and took over operations. When their original goal of maintaining general service failed to realize economic viability, the Bluebell Railway began operating as a tourist destination instead. 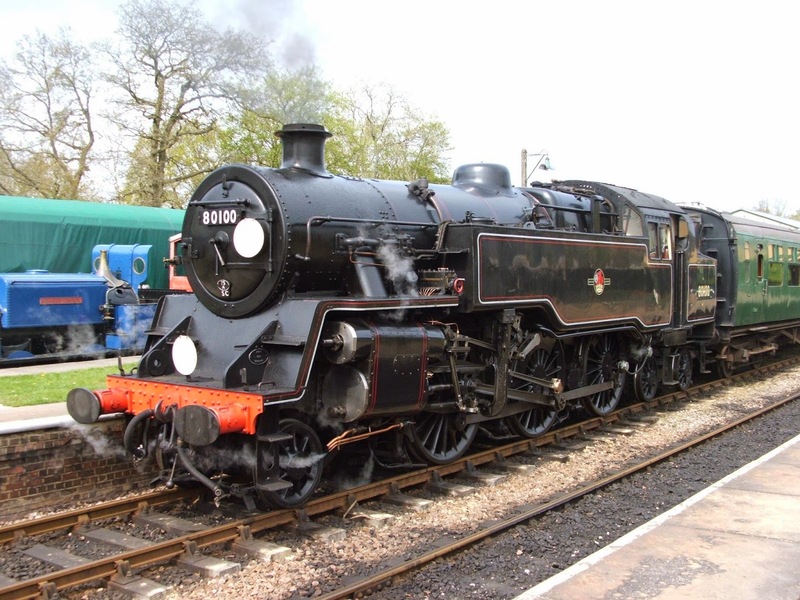 The Bluebell Railway’s equipment and routes have been featured in many film productions, and features prominently in The Railway Series and Thomas the Tank Engine. The Severn Valley Railway had a similar history. With a record of flagging traffic after the end of World War Two, the railroad closed during the Beeching Era. A preservation society succeeded reopening the line to tourist trains and a limited amount of freight traffic. Today, the Severn Valley brings together surviving steam locomotives from all over Britain, and the Severn also runs a program to allow members of the public to experience firing and running one of their steam locomotives. These are only two examples of shortline railroads that seemed to have reached their final destination during the Beeching cuts, only to rise again in a new (and financially stable!) form. Had the British Railways decided to retain ownership of the real estate surrounding closed railroad lines, or made more of an effort to integrate road and rail services, some of the most prominent heritage railroads in the United Kingdom might not exist as we know them today. Where entire railroad lines could not be rescued, it was often possible to at least save individual steam locomotives. The terms of the Modernisation Plan called for the liquidation of steam power throughout the United Kingdom in 1955, and the nation was almost completely dieselized by 1964. So many steam locomotives were withdrawn from service during this period that disposing of them became a logistical challenge. 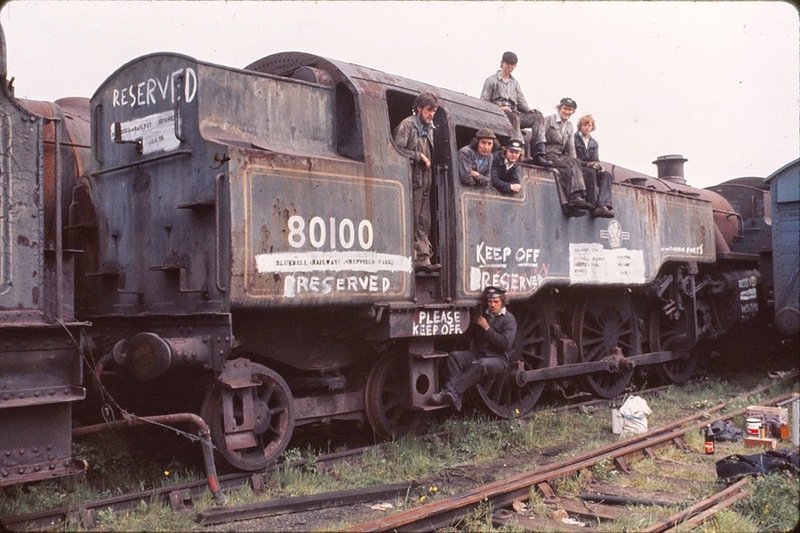 Rendering all of them into scrap in a timely manner exceeded the British Railways' capacity. In 1958, they awarded a contract to the Woodham Brothers Limited, in large part because one of their properties located near Barry Island, Wales included tracks where withdrawn railroad equipment could be stored before it was broken down. 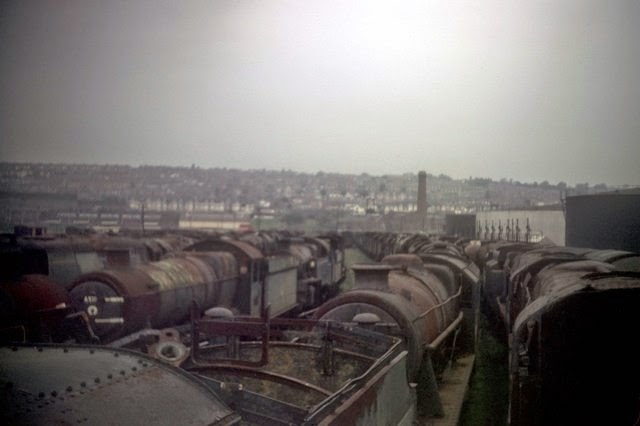 Nearly 300 steam locomotives were sent to Barry Scrapyard, as it became colloquially known*. The rows and rows of locomotives, cold to the touch and rusting away in the humid seaside air, came to visually define both the Modernisation Plan and the Beeching Cuts and the many other assorted enterprises owned by the president of the company, Dai Woodham. The pictures are a poignant metaphor for the many individuals and geographic areas that were cast aside and left to wither when the local railroads closed. 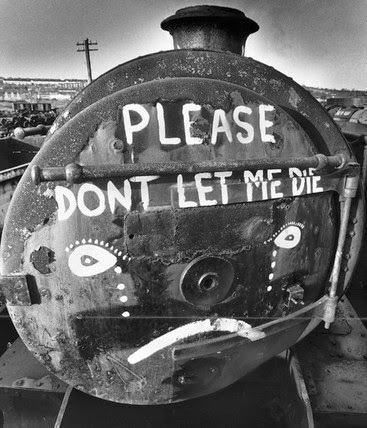 Ironically, the details of the Modernisation Plan provided these locomotives with a somewhat better chance of a life after British Railways than they did for the railroad's human employees. The many hundreds pieces of outdated rolling stock were also withdrawn from service and sent to Barry Scrapyard along with the locomotives. Since steam locomotives were outside the Woodham Brothers’ usual materials and are actually quite difficult to scrap--so much so that Dai Woodham had to seek outside education in order to learn how to perform the task--they instructed their employees to prioritizing breaking down the rolling stock first. This delay created a critical window in which preservationists could raise funds and make an offer on individual locomotives sitting within the scrapyard grounds. The Woodhams had no particular interest in railroad preservation, but realized that selling off the steam locomotives would allow them to turn a profit on the withdrawn BR stock much more quickly than waiting until they had time to scrap them. As the number of locomotives remaining at Barry began to dwindle, preservation groups offered much more than their value as scrap. In the end, more than two thirds of the locomotives that were sent to their doom at Barry were purchased and restored--213 out of 297 delivered. The majority of those rescued have been returned to functioning condition. The most famous of all the locomotives to do time at Barry was the ex-GWR # 4900, used in the Harry Potter films as the Hogwarts Express. 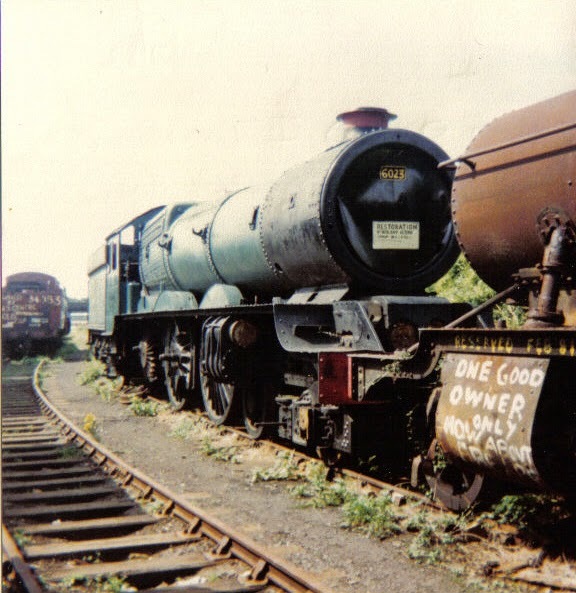 The first locomotive considered and then rejected for this role--the Southern Railway #34027-- also spent time in the same scrapyard. The state of preservation in Britain would be much different if the Modernization Plan had avoided one of its most prominent flaws and phased diesel locomotives into the fleet over a longer period of time. In that scenario, the locomotives would have been withdrawn individually or in small lots, easily disposed of by British Railway's own employees and highly unlikely to have ever reached the point of being offered for public sale. Both the proliferation of British locomotives existing to the present day, and the protected in which many of them operate, are ironic and unintended consequences of the policies designed to remove them. *Not to be confused with Vic Berry's Scrapyard in Leicester, which in the 1980s received a large contract to break down rolling stock and defective diesel locomotives ordered by the Modernisation Plan.